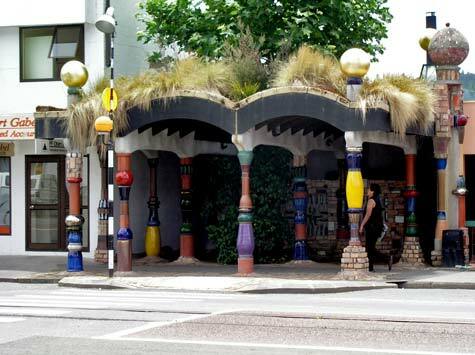 The main tourist attraction in Kawakawa is the colourful public toilet designed by Austrian artist Friedensreich Hundertwasser. First visiting New Zealand in the 1970s for an exhibition of his work, he decided to make the country his second home and bought property on the Waikare inlet, east of Kawakawa. In 1998 with the help of the community he transformed the town’s public toilets into a work of art.